I've never been someone who has had an identity crisis. Or at least, I've never felt like I've had an identity crisis. While other kids and teenagers experimented with extremes and lifestyles to try to figure themselves out, I felt like I generally knew who I was and where I was going. It seemed I've always had a solid foundation in my identity. But it wasn't until several years ago that I realized that although I had a solid foundation, I had other junk in my identity cluttering up the space between me and my foundation. I've met people who define themselves by their career. And frankly, it's hard not to in the society we live in. 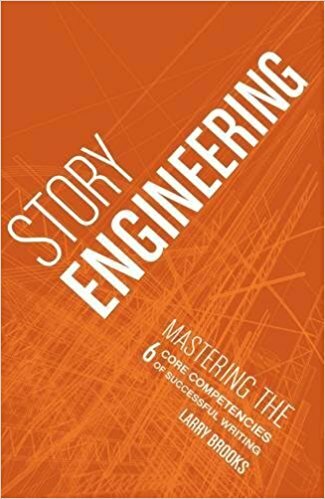 It starts at a young age, when people ask, "What do you want to be when you grow up?" and as a people, we know that what they really mean is, "What do you want to do for work when you grow up?" And just that simple question shows that our society equates "being" with "work." In other words, from a young age, we are being taught that our identity and value is defined by the job we have. I've met other people who are defined by relationships. Their identity is founded on who they are dating, and who they are is rooted in their relationship status. I've met people who define themselves by titles and medals and achievements. Others who have their identity founded in talents, hobbies, and abilities. I knew a girl who defined herself by her likes and dislikes. But my identity issue did not come from standing on shaky foundations such as these. It came from not letting go of them. See, I envision people's identity-foundation like a tower of blocks. Each block is something that is a part of us. Some "parts of us" don't give us a very stable foundation. The examples I gave have foundations like this. It's a shaky, unstable foundation. If your identity is founded on your job and you lose your job, you've lost your identity. What's scary is sometimes you don't realize how much of it made up your foundation until you lose it. Same can go with other things. Lose your authoritative title and therefore your ability to be a strong influence on others, and you've lost yourself. If your identity is made up of winning marathons, then if you end up paralyzed in a wheelchair, you've lost your identity. And because these were part of your identity, it becomes a very painful psychological thing to process. There are, in my opinion, only two blocks, that when yoked together, form a stable foundation for an identity. The essence of yourself, and God. Now, I'm Christian and Mormon, so some of my ideas for this post are based off that belief system. But I realize not everyone believes what I do, and that's fine (yay diversity), so please feel free to adapt this concept. Maybe, for example, you don't really believe in God, but you believe in "truth." Then feel free to think of it that way. Whatever works for you. 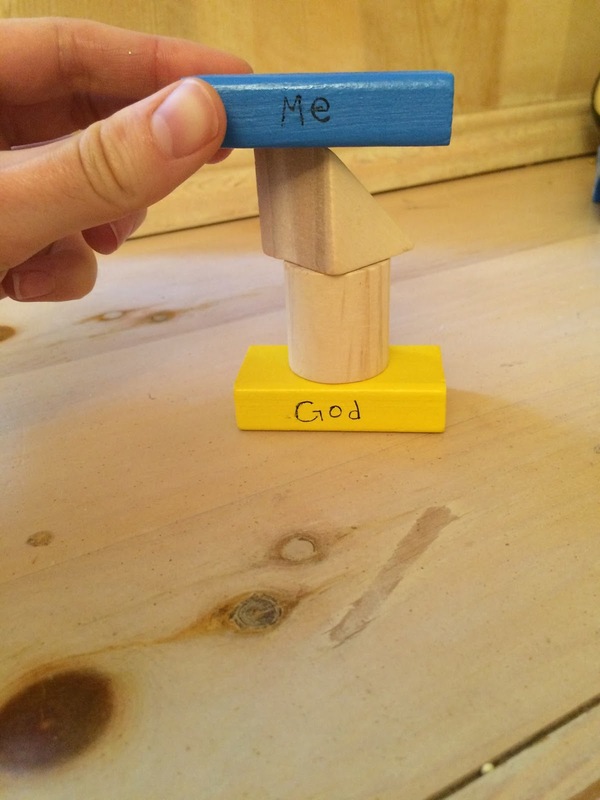 So then you have God as your foundation block. But doing that alone isn't enough. 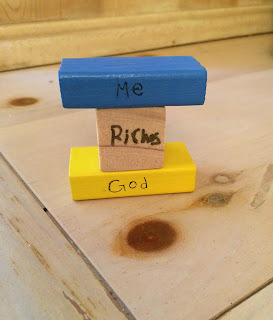 See, when I was in college, I realized that although I had my Heavenly Father as my foundation block, I still had other blocks cluttering it up. 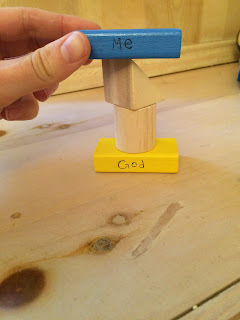 Even with a good foundation, I had these other things between me and God making it shaky and less stable. Now, are these other things--talents, abilities, awards, relationships, jobs--bad? Of course not! They just don't belong in the foundation of your identity. They have a good, healthy place, it's just not in there. So again, my problem wasn't that I had a completely sandy, flimsy foundation, it's that I needed to let go of these other blocks in my foundation. 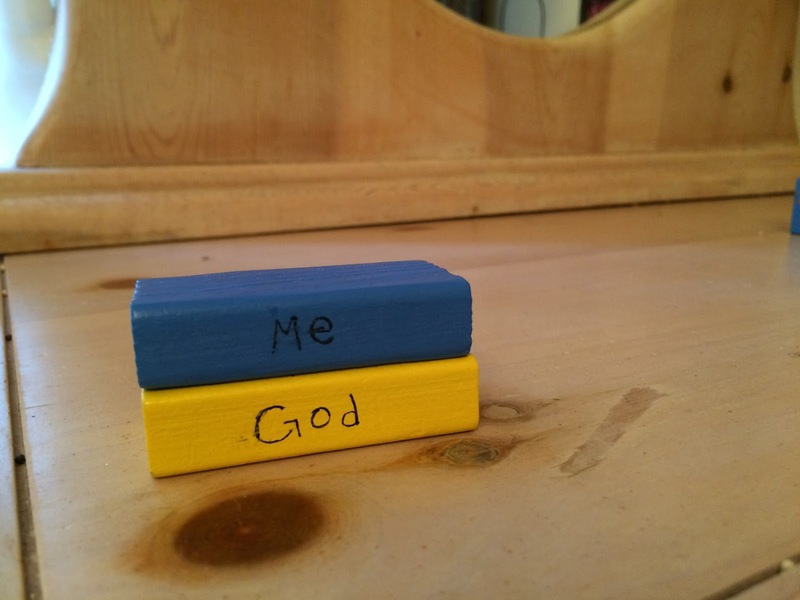 It was more difficult for me to follow God's plan for me because I had all these other blocks on top of my foundation, between me and God. And guess what? When I had to make a choice that I knew was what my Heavenly Father wanted me to do and was what I needed to do, that was right for who I am, it was sometimes really painful, because I had these other blocks on top, competing with the block that mattered most. They were at odds with each other. So it was painful to make decisions that went against these other blocks in my identity. It made it harder than it needed to be to do what was right. 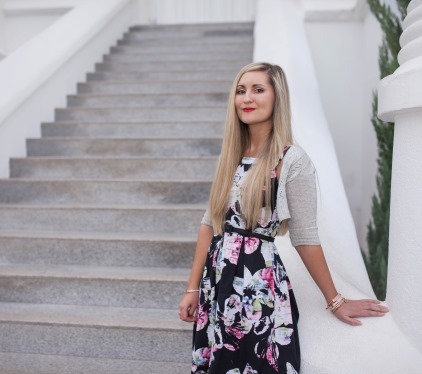 If there was something I felt I needed to do--which was right for me and/or my Heavenly Father--but in my foundation, I was worried about what other people think of me, then it was really hard to follow through! Torturous even! The beautiful thing though, is that the reality is, you don't have to go through that level of torture! If you remove that block before you encounter such a situation, it won't be able to compete with the most important block. If you remove unnecessary blocks from your foundation it literally gets easier. It will be easier to do what is right. It will be easier to be sincere and authentic. 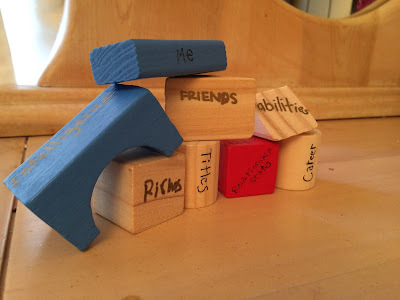 I talked about what some of those blocks might be, but the one that was lodged into me most deeply, that I didn't even realize until I was an adult, was what other people thought of me. Now when we say “don’t worry about what others think of you,” what usually comes to mind is the really obvious things, like being yourself, wearing the clothes you like without caring if people don’t like them, or being friends with people even if others don’t like your friends. Mine wasn’t the obvious stuff. Mine was way more subtle. I needed to hear people say nice things about and to me. I needed validation. I clung to the good things people thought and said about me. It felt good. I needed to hear them. 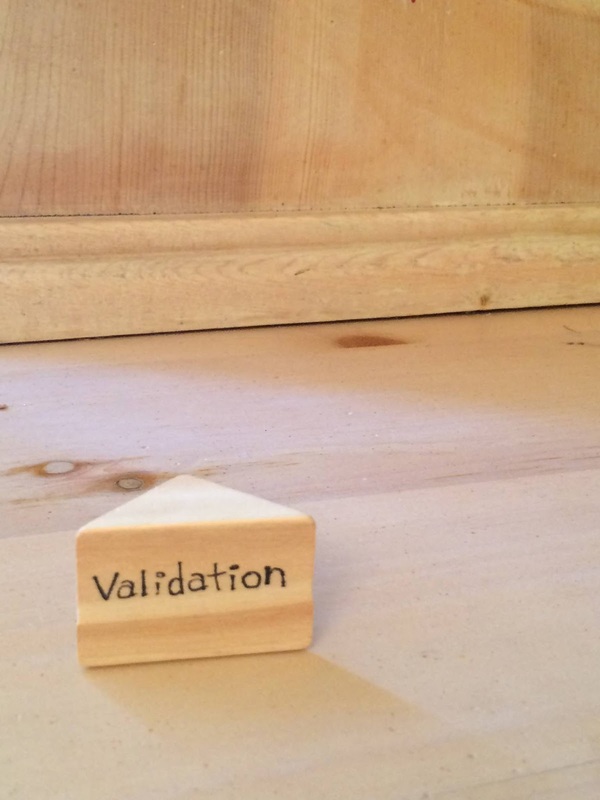 Let me explain what validation means. 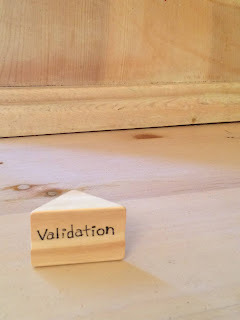 Validation means that if I had a certain opinion, and I expressed it, I needed to hear someone reflect it back to me. And if I didn’t, I felt bad. If I worked really, really hard at something, I needed to hear those words from someone else that I did a really good job. I needed to hear compliments. Again, it’s not bad to appreciate and enjoy those things. It’s not bad to like compliments. But for me, it was very, very much a need. I didn’t like compliments—I needed them. It was like I would get a little natural high off it. Now I don't want to over-illustrate myself as a desperate person, because I don't believe I appear that way or am that way. And I don't think people could see what was happening at all. It was all on the inside. But my point is, it was very real. And the negative effect of being that way is if I didn’t hear those words and get that validation, my identity—it didn’t collapse or anything—but it got a little shaky. And also, if someone thought something wrong of me, or thought me an awful person, or that I did something bad, it could eat the heck out of me. There have been a couple of instances where it tortured me internally for days. I realized, as I got older, that I was defining myself by outside sources. And because of that, I often struggled with trusting myself, because I needed other people to validate that I was doing was the right thing, or that my opinion was right and acceptable. I was looking for validation from everyone around me, when validation from only my Heavenly Father should have been good enough. Now, your block might not be validation like mine was. Yours might be something else. Or, you might have no clue what yours is or what it might be. But think about it and think about things that you have a tendency toward that may have a chance of becoming that block. What kind of person was this man? Was he a thief or criminal? No. He was someone who wanted to follow God. He wanted to be better. But he lackest one thing--his love of money. His money was part of his identity. If it wasn't wedged in there between himself and God, he wouldn't have felt so sorrowful. His love of money was at odds with what Jesus wanted him to do, so it made this decision too difficult. Now, if that block of riches hadn’t been there to begin with—he could still be rich, but it wasn’t a part of who he actually was—it would have been easier to do what Jesus wanted him to do. In fact, with that block in particular, he probably wouldn't have even been sorrowful about it. I like the idea of being yoked to God, because when I'm not sure of myself, I know that He is. He believes in who I am, and understands who I am, even if I don't. When we are unsure of ourselves, we can survive if God is in our foundation. Alright, I'm whipping out a Book of Mormon scripture, cause it's a great one. Please take what rings true to you, but if you are a bit open-minded or believe in the Book of Mormon yourself, listen to the promises made to us in this scripture. Have you ever felt trapped in endless misery and woe? I know I have. And it is not fun. One of the reasons these promises are true is because when there is nothing else in our foundation, and only God, nothing else can have power over us, because we won’t let it. It’s not there, it doesn’t have any roots. Whatever gets sent our way, if you lose your job, your money, your friends, if you get in a horrible accident that forever ruins how you look or makes it so you can never do gymnastics again—it CAN NOT drag you down into endless misery and woe, and you literally can not fall. It does not have power over you. So how do you get rid of these blocks in your foundation and put them in their proper place? How do you make it so they are connected to you, but you are never a slave to them? Well, it depends on what your block or blocks are. If someone gave me a nice note or a thank-you card or whatever, I challenged myself not to look at it for several days. If I ever had to give a talk or do something in a public setting in front of people, I'd challenge myself to leave the room as soon as appropriate, knowing that the only reason I'd linger was so I could get validation by people coming up after to tell me I did a good job. In doing this, it helped me learn that I did what I thought was right, and what I thought God wanted me to do, and I did my best, and it didn't matter what other people thought--bad or good. I did things like this for weeks and months, and slowly got back to normal life. Today I’m able to genuinely appreciate compliments, without being dependent on them, without it being the foundation for who I am. Now, those are my examples of what helped me. Those same things might not help you with yours. Like if you struggle with friends being in your identity, it might not be a good idea to ignore your friends for a few months, right? So as you ponder about what to do with your block, if you’ve figured out what it is, use some common sense, be sensible, on what you can do to let go of it. It might be just trying to change your attitude or the way you think. And it’s okay to still have it floating around out and about, but it shouldn’t be in the foundation of your identity. As you start letting go of these other blocks, amazing things will start to happen. It won’t be so hard to do what is right anymore, it won’t be painful to do certain things Heavenly Father has prompted you to do, since they aren’t at odds. You won’t have successes go to your head, you’ll be able to appreciate them and feel good about them without becoming prideful. You won’t struggle with your self-worth because it’s not being determined by these other outside things, only God. Do the hard part now, of letting these blocks go, and these things will be so much easier in the future. If nothing else, it will be easier to be your best authentic self. This is lovely and so true. Thanks!